Another season of Annual Refresher Training has come to a close, and my wheels are turning for next year's sessions. The patterns of behavior and big ideas I took away from almost a dozen sessions are ready to get onto the page and in front of the next group of miners. Let's face it. Annual Refresher is often boring. A lot training sessions and conferences put most participants in a state of conscious that's just a notch above comatose. That's why every year I work hard to add new content and approaches to training, and this year was no different. Accident alerts was a new topic for me this year. As the season progressed, my presentation evolved, adding videos and deeper connections to best practices that elicited discussion. The goal is to be provocative in a way that engages miners to be serious yet excited about the content. The themes we drew from these 2016 accident alerts focused on being in the wrong place at the wrong time and taking full advantage of safety features. 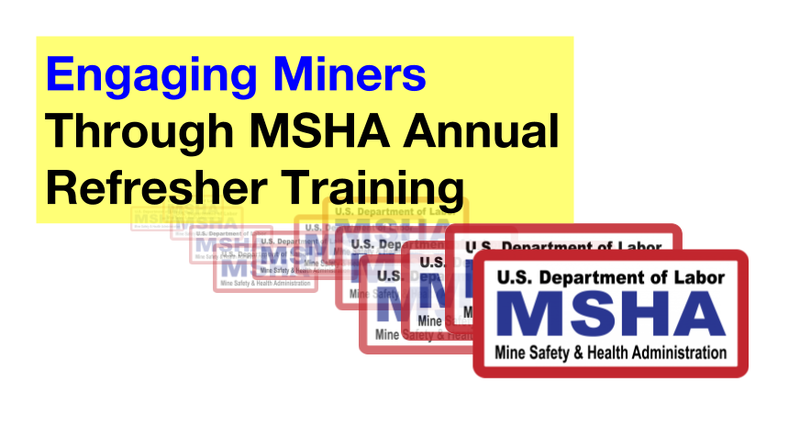 Each image includes a short description of the accident (msha.gov). My analysis and other resource suggestions follow. Seat belts are a sore subject with me. I've been operating heavy equipment for 20 years and have unfortunately observed more people who don't wear a seat belt than otherwise. Imagine being in the accident shown above without a seat belt. 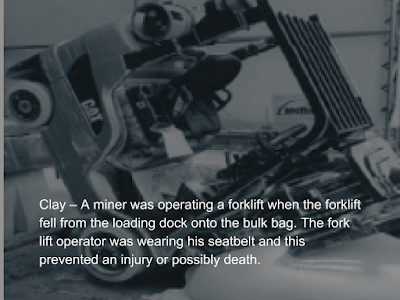 Since we bring up seat belts often, I chose to focus on forklift safety issues. The video below shows a man used as a counterweight and a women who tries to rescue the load, leading to her death (graphic content). It doesn't take height to die from a fall. Last year, a miner died after falling off a haul truck in a bone yard. If I remember correctly, he was fixing something or looking for parts. He should have gone to the hospital and was found dead at the end of the shift. 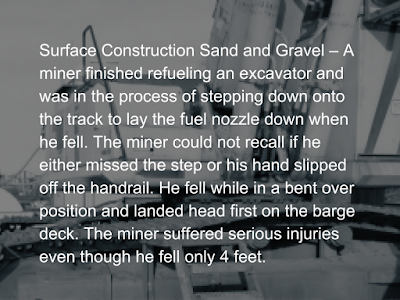 The miner who fell of the excavator, however, was lucky. 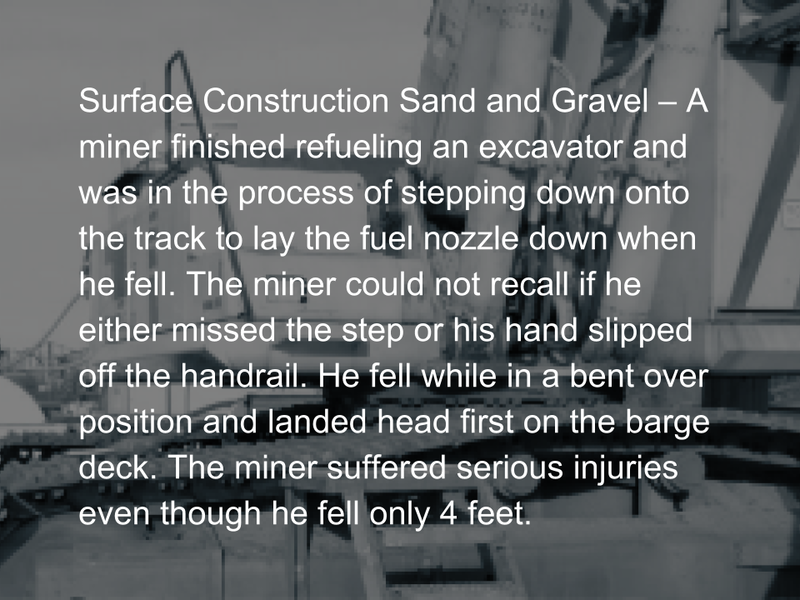 Steps and ladders must be in good working order and meet federal safety standards. Three points of contact, facing the ladder are crucial, too. It may seem like a stretch to think about hardhats when someone is pinned between a man lift and haul truck, but that's right where I went when I first saw this accident alert. Imagine you are crouched down in a tight spot, trying to manage a quick fix to get production back online. When you're finished and you stand up into the steel angle iron sticking out of the platform above, you're glad you put on your hardhat. 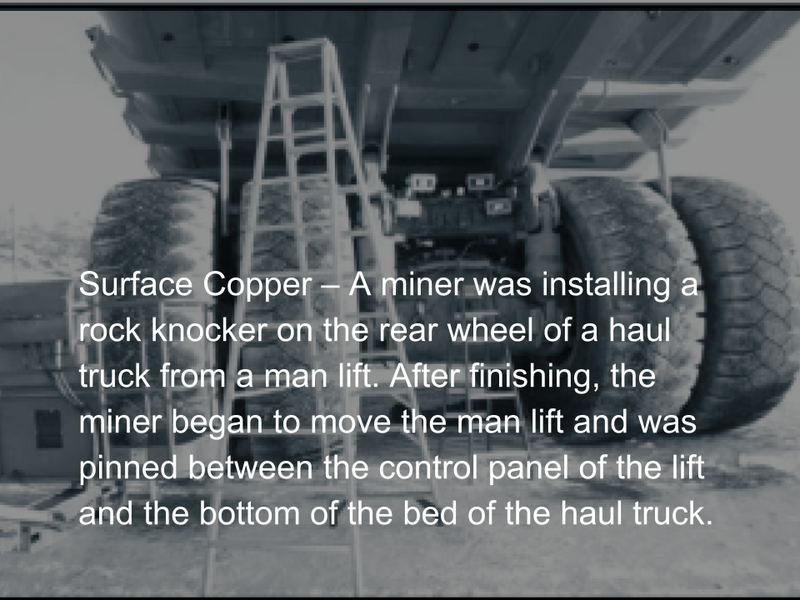 The miner in the man lift could have been distracted by any number of things. He could have been tired and stressed, which leads to increased anxiety and decreased working memory. Perhaps the controls weren't labeled properly on the man lift. These things happen, so expect them to and avoid starring in the fatalities presentation during annual refresher training. The truck driver and the forklift operator in the video below where definitely in the wrong place, at the wrong time (graphic content). Seat Belt. Seat Belt. Seat Belt. The truck driver in the image above drove into the berm. I don't know why. It could have been a cell phone distraction. He could have been tired and dozed off. The fact of the matter is that by wearing his seat belt, he avoided what could have been a fatal accident. 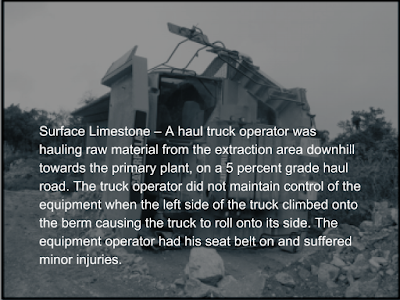 Haul trucks are the most dangerous part of most surface mining operations (based on frequency of fatalities). 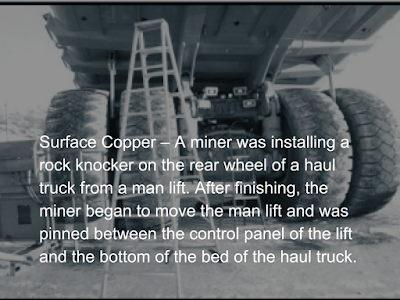 The video below is staged to show the significance of the haul truck's mass and velocity. Notice how the truck drives over the small passenger vehicle like a bump in the road. Inundation is when you are engulfed by material. This kind of accident is common when truck drivers relieve themselves between their truck and a stock pile. Unlike the image above, being in the wrong place at the wrong time can lead to death (about two miners died in 2015 from inundation). 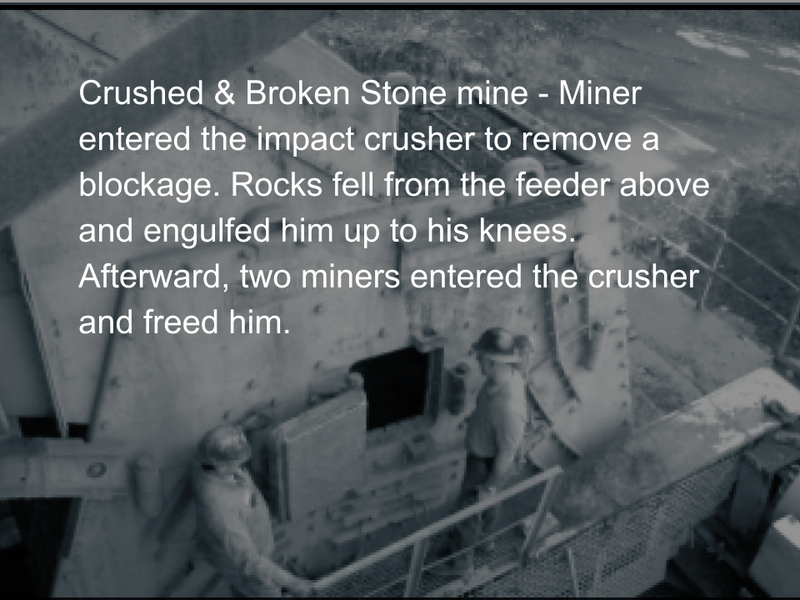 Material from the feeder fell into the crusher where the miner was removing a blockage. 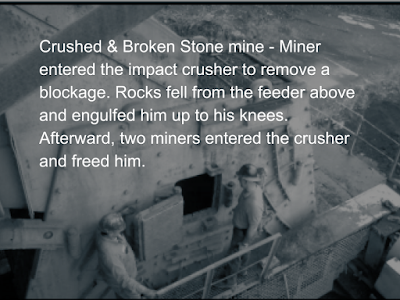 Considering that feeders are designed to put material into the crusher, this situation does not surprise me. When I worked on processing plants, we often had a hydraulic hammer maneuvered with a stick and a boom. If someone was going into a crusher to free a blockage, the large rocks were moved with the hammer, the fly wheel (on the jaw crusher, different style than the one in the image) was chained to avoid pitman movement once the blockage was removed, and the machines related to the affected area were locked out. The good thing about the situation in the image above is that the miners were not working alone. It is so important to work with people and have effective means of communication. Otherwise, it's not worth it. Stay safe out there, and follow this blog for email updates (No spam. Only content like this post.). 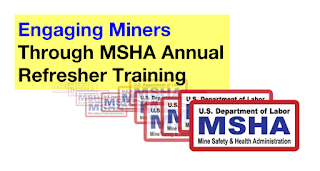 Mining the Surface is about the stuff I learn working in the mining and construction industries – lots of safety and federal compliance issues. You'll find posts about training methods, using data to drive programs, and stories about issues I face in the field and at the desk.